RIP. Ryung my fav Korean T, sad to see him go. GLHF in life. Best of luck to Ryung. Really seemed like him and Crank had some nice streaming going together. Oh, so that's the date. At least this isn't a surprise because crank, ryung and MMA have been talking about this since season 3 ended in crank's stream. Very funny those three. That's a shame, I always enjoyed watching him play. 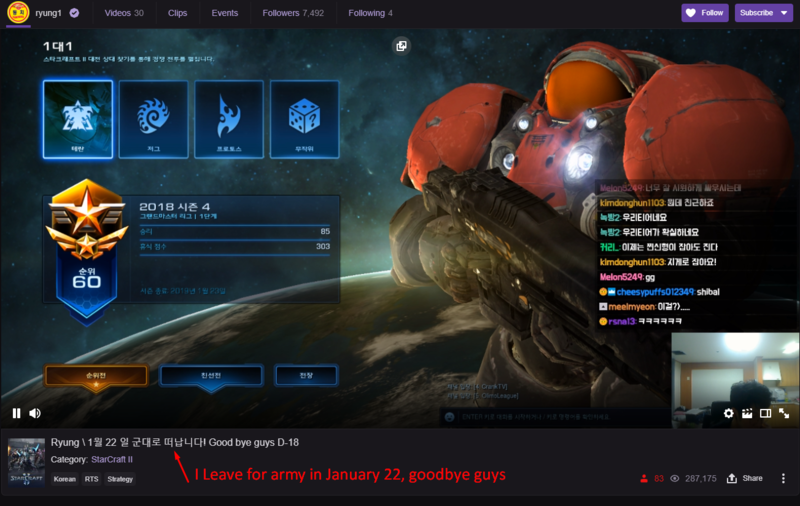 Hope to see him back afterwards, but who knows what will remain of the Korean scene by then. Who remains for Slayers now? I remember a time when TY and Maru had 80-95% winrate in TvT, while Ryung had a little over 50%. The thing was that Ryung only played vs TY and Maru. This was a few years after the "Ryung is OP in TvT". This was when Maru went 10-0 in Proleague. Do we only have Pimpact left from the Axiom boys now? Yeah competitive-wise. We still have CranK as the SC2 Korean commentator.